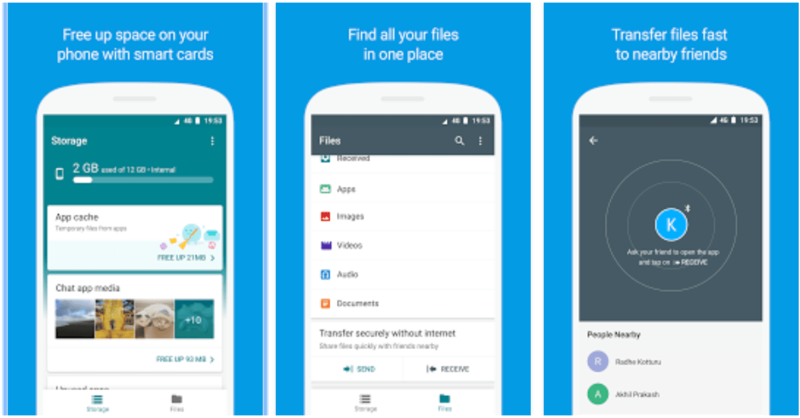 Google has come up with a File sharing app this time. The app is now available in Beta mode for Android users and will be coming to public very soon. Still you can visit Playstore and download its Beta. Files Go is designed to allow its users to manage their files, transfer data with others. This app also helps you in saving your phone storage by clearing the App cache, duplicate files/photos. It recommends rarely-used apps to be removed so that your phone stays faster and saves battery as well as storage. Files Go is a light weight android application, focused on saving mobile battery, less storage and limited mobile data. It follows the default look and feel of the Android Operating System and fulfills the basic requirement of a File Manager as well as transfer app. It’s size is less than 6Mb. It connects using Bluetooth and Wifi Direct (via Hotspot) with another phone to transfer data. At this moment the app is available in Beta mode and going through lot of changes and upgrades. So until the stable mode has been released, we may see a lot new features getting added up. Best part of Google’s Files Go is that it is going to be completely free of cost and neither their would be those annoying advertisements ruining your mobile experience. Thus it would be completely safe.